This mini portable photo booth is a simple solution that will bring 3x5 and 4x6 printed pictures onto a user’s iPhone in a matter of seconds. 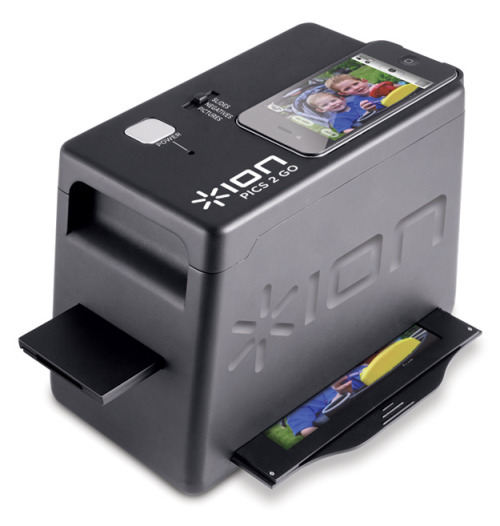 Ion's new Pics 2 Go helps you easily bring all of your precious photos prints, negatives and slides into the digital world by using the built-in camera on the iPhone 4S and iPhone 4 without the need of a computer. Using your iPhone to "scan" photos into digital ones sounds very familiar. It includes a free app that allows users to edit slides and pictures and invert negatives into actual photos. The app also includes color correction, brightness controls and the ability to email or post a picture to Facebook instantly, all without a computer. The Pics 2 Go photo tray features separate areas for 3×5 and 4×6 prints so the picture is held perfectly straight and ready to capture. There's a hinged frame that gently presses photos flat and prevents them from bowing. The design of Pics 2 Go ensures consistency and quality because photos are always in the same position with the same lighting, and your iPhone camera is always in the same spot so there’s no adjustment needed. Two additional trays are included, one for negatives and one for slides. No exact release date available. But the $59.99 price tag sure makes us think why not just use a printer scanner?